Previous post: Monday night Madness! I was recently nominated as a recipient of the Liebster Award by Louise Fowler of louisefowler.com. Louise is one of the most expressive and well versed bloggers I’ve come across. This is a true life blog in which she vents and shares what just may be the deepest and most gut wrenching aspects of her life – past and present. 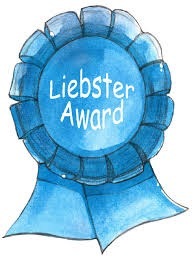 The Liebster Award is given to up and coming bloggers who have fewer than 300 followers. This is a great way to help build your blogging community and a great networking tool that brings your blog to the attention of others. Once you’re nominated, if you choose to accept, after thanking the person who nominated you, you must answer 11 questions about yourself or your blog, then give 11 random facts about yourself. The next step is to nominate 11 other bloggers and create 11 questions for them to answer. Then simply stop by each of those blogs and tell that blogger about the award. 1. Who is the most supportive person in your life and why? 3. What is your biggest challenge? My biggest challenge is accepting the fact that my oldest child is no longer a child. She is almost 23 years old and I still want to baby her! 4. What would have to happen for you to take a stand and speak up? Not much, I am very outspoken and I always speak up for myself, the under dog, my children, and for any cause I think is in my best interest. 5. What do you find offensive? 6. What do you value most? 7. Where are you most successful in life? I am most successful as a mother. 8. Did you like school and why? 9. What is your favorite time of the day and why? I AM A MORNING PERSON! I simply love getting out of bed in the morning and going out to seize another day. 10. Do you care about your “numbers” in the blog world, or do you write just because you like it? Initially I wanted numbers but I now just enjoy writing and connecting with others. My children, our dogs, my brothers, funny movies, scaring people…, what can I say… I love to laugh! I love working with at risk kids. I wish I’d had more children. I feel that laughter is the best medicine. I’m afraid of dead people. My brothers and I dressed alike when we were small children. I truly dislike mushrooms, asparagus and squash. As a child I ate hog brains (they taste and look like scrambled eggs when cooked). My first (and lifetime) crush was Micheal Jackson. I wish I could sing like Whitney Houston. 2. If you were stuck on a desert island who would you want with you and why? 3. What’s number 11 on your bucket list? 6. How did you discover blogging? 7. Who do you find to be the most influential of your blog followers? 8. How many days per week do you post on your blog? 9. Who is your favorite cartoon character? 10. If you could dance the night away with anyone, who would it be? 11. What is your least favorite household chore and why? Congrats to you, well deserved, i think your blog is a refreshing one, so power on, entertain us some more….and yes realising your children are adults can be a difficult thing, my children’s mother tends to want to mother them and most of them are in their thirties now. It does lead to some tension. Oh you mean the kids are telling you? Not a good idea I wouldn’t think. The tension you mentioned… as in the “kids” are bothered by being babied, correct? Oh indeed, I can understand their reactions……I find now I have lovely adult relationships with my children…..my kids made plenty of mistakes and I determined to be there for them. The last thing they needed from me was me telling them what to do but rather someone they knew they could come to to cry on my shoulder and offer them support. Their mother still can’t help but tell them what to do. lol— I may still try to run things but believe me, my young adult has a mind of her own! Wooohhoooo!!! Mon Congrats & well deserved…. Congratulations! Your blog is fun and diverse. I enjoyed reading about you. Making acquaintances in the blogging world is proving to be fun! I couldn’t agree more. I am thoroughly enjoying everything about blogging. 🙂 You are an awesome writer and you have a very powerful message to share in your writings.